I hope everyone had a great weekend!! I did not get as much creating done this weekend as I hoped--today was a beautiful day out and we needed to take advantage of it since it's going to go downhill starting Monday. 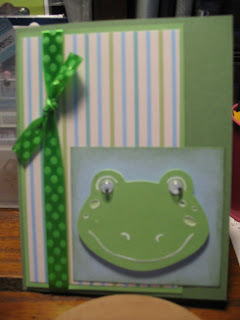 This is a simple frog card I made last week. I used Animal Kingdom for the from face. I pop-dotted him on there. I did cut out a base layer and then the top layer to give him different colored spots. I added the googly eyes for some fun. This would make a cute boy card and it was super easy to make! Helen, your blog is gorgeous! Great creations! Hope to get to know you better soon! Hi Helen, I found my way here from the Cricut MB. Your blog is beautiful. thanks for hanging at the Cuttlebug Challenge blog! hehe, the frog is cute! I won a blog makeover!! !